Here's another Face Contest swinging your way! 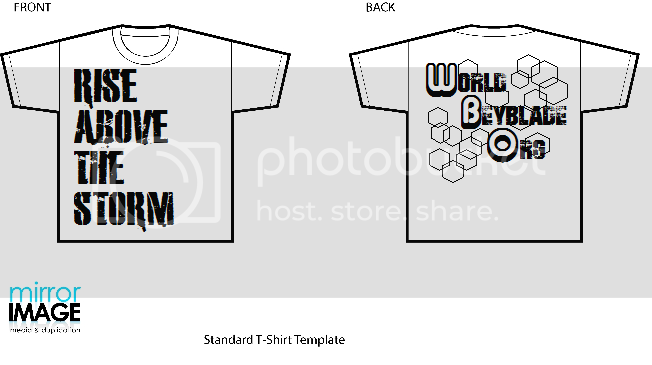 The challenge this time is to come up with a design inspired by the WBO for a T-shirt! Who knows: if it's really legit, it could actually become an official T-shirt for sale?! 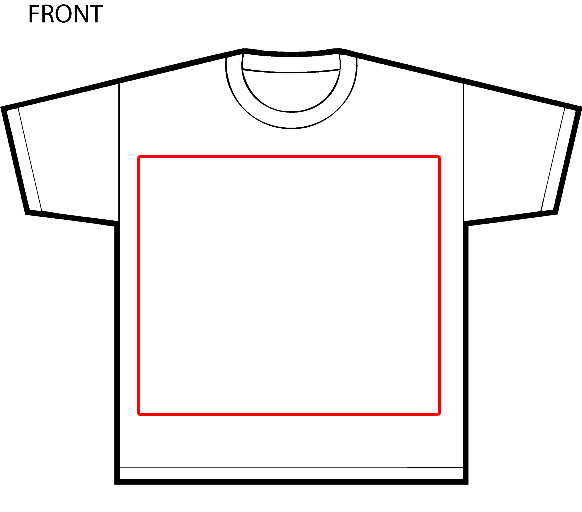 We're really looking for anything at all, but keep in mind that pictures that are clearly the object of a copyright are unlikely to get used for a real T-shirt since we don't own Beyblade at all, but that being said, know that your design needs to fit onto a certain space shown below, and be creative! Inspire yourself with these great graphics to come up with original logos that would look cool on T-shirts without being copy-paste Beyblade! Seven years, but no less mysterious! What could be inside them?! As usual, there will not be only one winner - a whole lot of three winners are going to be chosen! Awesome! For this special occasion, for a Face Contest theme we have never done before, the TOP winner will win an actual physical prize too! What's more fitting than... getting your own T-shirt with your design?! 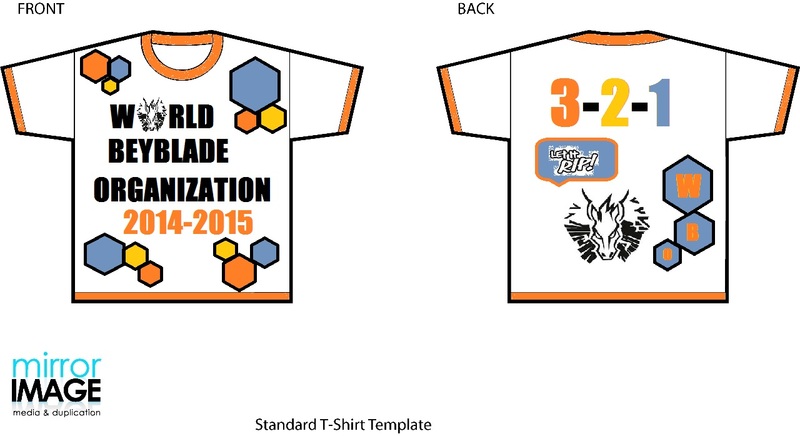 That's right, whoever wins will actually receive the T-shirt with their design printed on it! 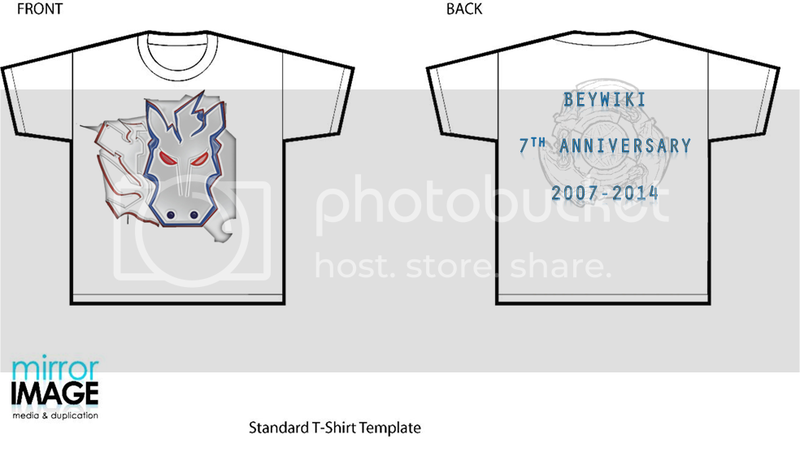 Designs must have to do with Beyblade and promote the World Beyblade Organization. The WBO logo should not directly be used, seeing as, for copyright issues, we cannot sell T-shirts with the Pegasis Wheel design on it. Limit the use of copyrighted material as much as possible; using some will not disqualify you, but it's encouraged. Any picture of a Beyblade, character, etc. is copyrighted material. Furthermore, this is a design contest, so taking images straight from the Internet to use as backgrounds, for instance, does not count as designing since you did not create them. Limit one entry per person! Your first entry will be the only one that's considered, so work hard on it! The WBO Committee isn't eligible. Boo. You have until 11:59 PM EST Friday, October 31st, 2014 to submit your T-shirt logo. Any entries after that will be disqualified! All entries should originally be 300dpi in size and quality. Every participant should mention with their entry whether they meet this requirement. A T-shirt... Hmm... That's not something we're asked to design everyday. But you guys can do it! Let your imagination run wild like an XF! Woah, count me in for sure. This is a great idea- props to the committee. Would we be able to use the WBO Logo for this, though? Oh, definitely count me in! This is very interesting, it should be fun, too! I love this community, haha. Ill have my design in soon! 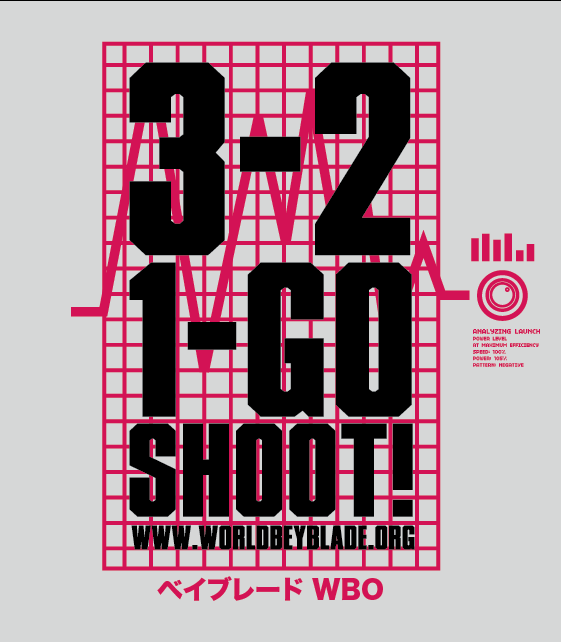 (Oct. 07, 2014 8:50 PM)Leone19 Wrote: Would we be able to use the WBO Logo for this, though? Technically yes, but remember that we have encountered issues in the past with selling T-shirts with our logo since the Pegasis Wheel design is copyrighted. I think that's it lol. Technically yes for everything, but as is mentioned in the opening post, copyrighted pictures (besides our logo) will usually stop a T-shirt from being sold officially. Count me in, I'm not great with that kind of design but I'm going to do my best ! Could the committee possibly outline the boundaries of their printing area, assuming there's a limit? (Oct. 07, 2014 11:38 PM)AÉ´É¢Ê€Ê Fá´€á´„á´‡ Wrote: Could the committee possibly outline the boundaries of their printing area, assuming there's a limit? Finished my initial design, hopefully I can have it finalized soon. This is actually a pretty neat contest idea- props to whoever came up with it. Count me in to, I'm so hyped!!!! Hey, we noticed that there had been a serious misunderstanding somewhere along the way, which has produced entries that are totally different to what we were looking for. The creativity requirement is not met in the way we were thinking of. Stay tuned for big changes coming up probably later today! The Face Contest is open again! We made a few edits to the first post that contains the rules and requirements, but just keep in mind that we're really looking for you to design the logo that goes on the T-shirt, no the T-shirt itself! The deadline has also been pushed to October 31st due to the delay, and all of the entries that had been previously submitted have been deleted. That means you can all start over, since almost none of the entries represented what we were looking for with this contest. So, take some time to read the first post all over again in order not to miss anything, and good luck to all the participants! I don't have the right tools I'd like. I'm not gonna be very good at this. Nothing special really.. i only used paint. -->Washington State Thread, please help out with tournaments. Our logo is our logo. 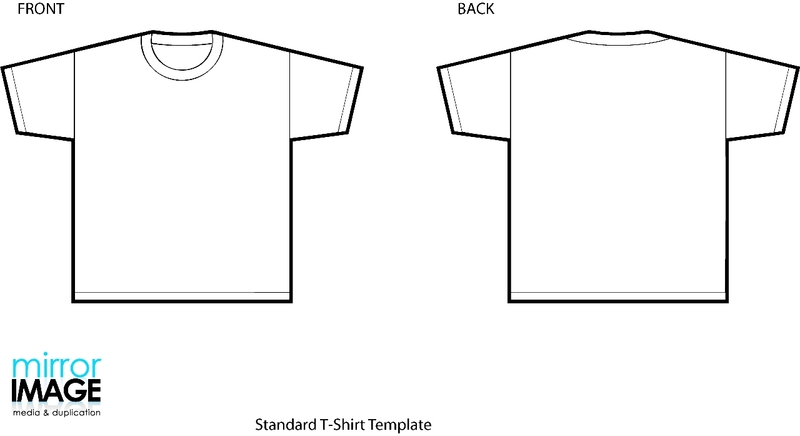 Technically, what goes on a T-shirt is called just a drawing, a design, etc. And there are typical drawings that only belong well on T-shirts. By the way, your design does not need to be done on the computer : like with most of our Face Contests, you can draw it if you think it will allow you to present your concept as much as possible. Sometimes, the programs you have on the computer limit what you can do. I'm so happy this is finally back up, I'll add my design later today. I created the Pegasus on Illustrator, while I used the Burning Cerberus AR on the back with a few filters. Pegasus is the current banner, while the AR was among one of the original banners or logos if I remember correctly. I wanted to give Pegasus the look of it was "breaking out" from the shirt. EDIT: Didn't realize this double posted, haha- please feel free to add this to my original post and delete this one. My bad. We might not determine who exactly is in second and third place, but the top three will be known. Not at all, although it will take us some extra time to create a render based on your drawing and then get that printed on a T-shirt for the prize. But technically though, any medium is good if it allows you to show the full extent of the design you have in mind. I made my shirt image as my avatar since for some reason I can't add it as an image when I reply, so yup that's my entry, if anybody has questions just pm me and i'll answer as soon as I can. (Oct. 15, 2014 1:31 AM)Dranzyan Driger Wrote: I made my shirt image as my avatar since for some reason I can't add it as an image when I reply, so yup that's my entry, if anybody has questions just pm me and i'll answer as soon as I can. thank you @Kai V and BBxcessive for helping me.